One of the more fun (and unique) things that we do with our Jeep is called Geocaching. But the truth is, you don’t need a Jeep at all. You just need a handheld GPS device (or a cellphone with GPS enabled). You see, there are caches (bundles of fun freebies) hidden all across the world just waiting to be found by everyday people like you and me. The adventure comes in the lengths that you will go to find them. Some are hidden in parking lots, on main roads, and in fairly obvious and easy-to-get-to locations. Others vary in the degree to which they are “off the beaten path”. So no matter what your level of adventure is, there’s a hidden cache that you will enjoy finding. And for those who enjoy puzzles, you’ll appreciate the fact that many of the hidden caches can only be “found” by deciphering some simple code, puzzle, or clues first. 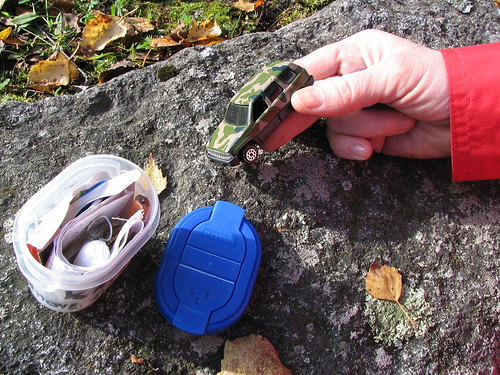 How Do You Get Started Geocaching? There’s really only one place to start Geocaching. Go to Geocaching.com and register. Access to the hidden cache locations — you can view longitude & latitude coordinates, as well as location details information for all geocaches that have been hidden. To find ’em, you can search by city, state, or zip code. The ability to organize your geocache listings and create your own favorite lists. You see, once you get started, there are SO many caches that you want to find (and hide yourself, too). And it begins to get overwhelming with so many fun choices. You can create custom searches based on geocache size, location, attributes and more with “Pocket Queries”. Be instantly notified of Geocaches — so you’ll have a chance to be FTF (the first to find) a new cache. Find geocaches along a route on your next road trip. Tell them where you’re going, and they’ll let you know what geocaches are along the way. I encourage you to sign up for the FREE membership first. 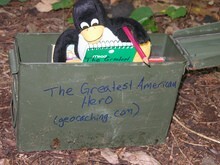 See what Geocaching is all about. And if you like it, and need a better way to keep track of all the caches you want to find, then move up to the Premium membership. It really is a good deal. Just make sure you’re going to have the time, energy, and desire to find hidden caches more than just once in awhile first. I would encourage you to reach through these articles. 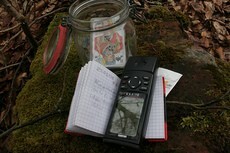 They include the “best of the best” tips to get started Geocaching. Then, my advice before you head out to find your first cache would be to look around your house now for some small and medium-sized trinkets that you can leave behind in caches that are large enough to accept items. It’s considered “Geocaching etiquette” that you take one item from a cache, and leave another item of equal or greater value in return. That keeps the caches alive and ever-changing, and fun for everyone who finds them — even years later! Finally, after you find your first cache, come back home and log your experiences with each of the caches you found (if more than one) at Geocaching.com. The following Geocaching lingo will appear in the online logs found below each cache‘s details. Warning, in those same logs, you are likely to find “spoilers” or clues that will make it much easier to find the hidden caches than if you were to search out the spot on your own. FTF – “First To Find.” The very first person to locate a cache after it has been placed. TB (or Bug, or Travel Bug) – An item with a unique tracking number assigned by Geocaching.com that travels from cache to cache. If you find one, you’re re expected to place it in a different cache within a reasonable amount of time, so it can continue its journey. Travel Bug Hotel – A geocache which serves as an exchange point for Travel Bugs that are on long journeys. The Next Step: Hide Some Caches! Finally, after you’ve found a few hidden caches, and you have a better idea of what people are looking for inside a cache, then you can take Geocaching to the next level by hiding a cache or two yourself. Jim and I have been saving up some unique items to hide in caches, and we look forward to seeing who finds our stuff and what others think of the caches we leave behind. Now we just have to find the “perfect” places to hide caches — either near where we live, or when we’re traveling out and about. So, for us, this is getting more and more fun every day! In case you’re wondering, Geocaching is an activity that is so well-organized and so widespread that many (including myself) consider it a sport. It’s definitely a close-knit bunch of folks who participate in Geocaching. And it’s tons of fun. You never know what you’re going to find. Along these same lines… nothing says the act of Geocaching has to take place just around your home town. Whenever you’re traveling to new places, do a quick search for hidden caches in the areas where you’ll be traveling. Fun Fun Fun! And, keep an eye out for Travel Bugs in certain caches… they’re intended to travel across the country from cache to cache. If you see one, re-hide it with your own fun goodies! Those are the top Geocaching sites for those who are “in the know” about all things Geocaching! Need a new GPS? Here are some features you may want your next GPS unit to have, if you’ll be Geocaching a lot.